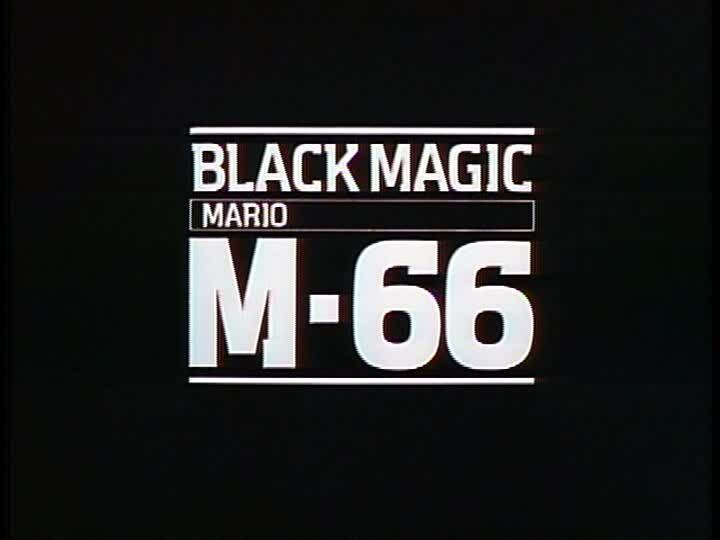 An excellent, short, action-packed film from the '80s, Black Magic M-66 is worth a watch. Synopsis: Sybel, a freelance journalist, investigates a covert military operation and gets in deeper than is healthy – A pair of advanced automated humanoid robots has accidentally been set to kill their creator’s granddaughter, Ferris, and she will need all the help she can to survive. 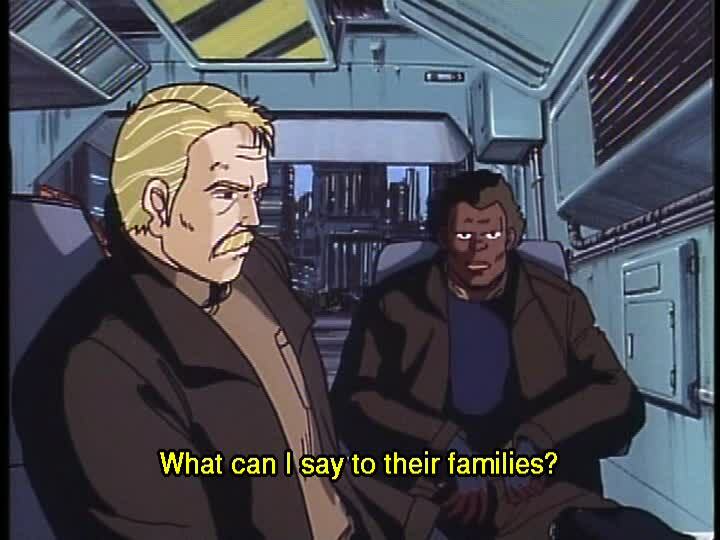 Even with Sybel helping her and the military trying to stop the robots, it will be a close thing. With a runtime of 48 minutes, this is a focused movie, with exactly enough time to tell the story it wants to and nothing more. The movie rapidly gives us the setup – two antipersonnel robots are going to kill Ferris; the military, led by the Colonel, is moving to stop them; and Sybel is going to get involved as a journalist. The robots themselves are pure killing machines, with laser eyes, super strength, an armored body, and a self-destruct combining thousands of deadly needles with poison gas. The first half of the film is a tightly controlled sequence of introducing characters, punctuated by an intense fight between the military and the robots. 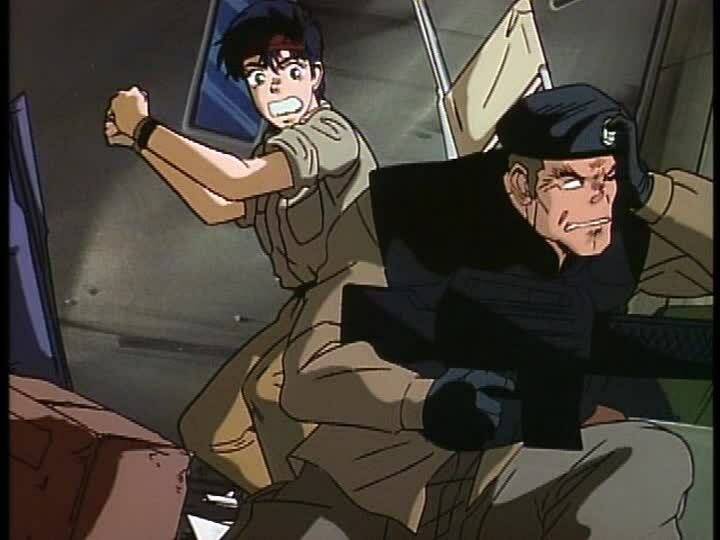 The second half is a perfectly paced chase sequence, with Sybel and Ferris desperately trying to escape the robots while the military tries to hunt them down. The movie is exciting to watch, and actually had me on the edge of my seat during the final chase. The movie has just enough atmosphere to it – the awesome, futuristic cityscape, the military’s paranoia about the whole thing being a plot from the nation they’re currently at war with, the cool, but not absurdly high-tech, gear used by the soldiers – to make it feel like it’s taking place in a reasonably thought out world, but not enough to distract from the plot or waste any time. The animation is something to behold. Released in 1987, this film has some of the finest hand-drawn animation the era has to offer, and it doesn’t cut corners. In scenes of the city, almost everyone is in motion. 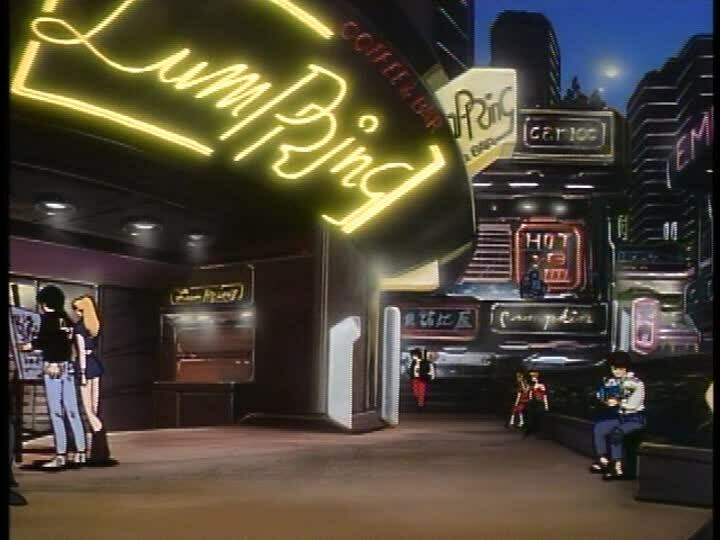 Many of the driving scenes with Sybel’s hummer use animated backgrounds rather than stills. 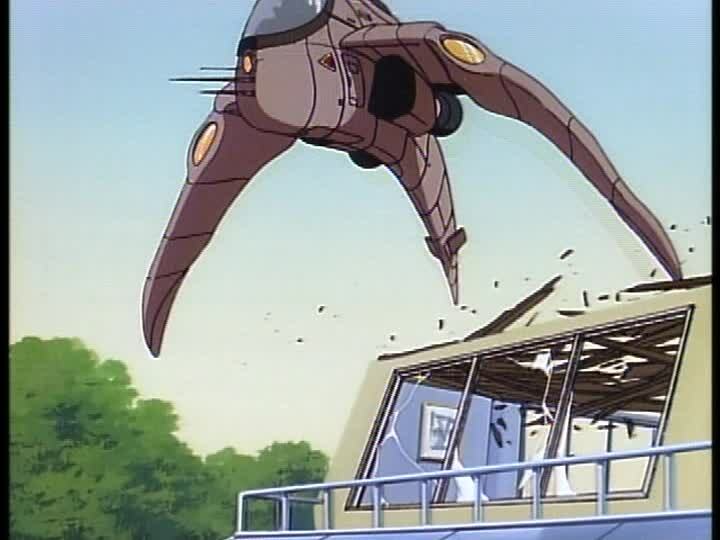 In one sequence in which the military’s hoverjet descends for a landing onto a skyscraper’s roof, the camera rotates around the roof while the hoverjet itself rotates at a different speed. The effect is impressive, and I can only imagine the expense and time that went into making it. Characters are all animated fluidly, and the combat scenes between the military and the robots in particular are incredible to watch – the robots move completely differently from the human soldiers, yet still believably, a mixture of graceful fluidity that is still robotic in nature; it’s hard to accurately describe. Scenes of destruction are also well-animated, with crumbling buildings, pieces of concrete knocked off by bullets, and other items of structural damage everywhere. There are no clean, vaporizing explosions here – every blast is filled with shrapnel and smoke. It makes for a very gratifying watch, and one that must have been a pain to plan and animate. The quality is so good that it’s almost as if the movie is flaunting it – in one scene, a small hoverjet rushes to get in contact with the top scientist, and accidentally flies too close to the house, causing a pressure wave that blows out the windows and destroys the roof. 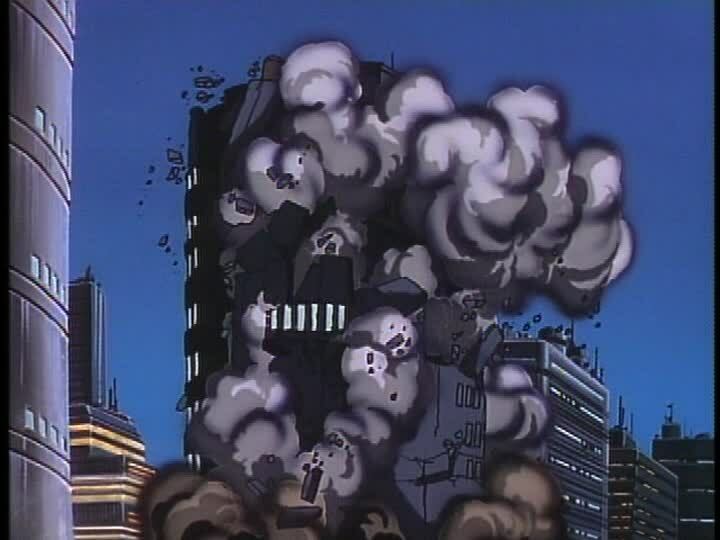 The destruction of the house is fully animated, even though there’s absolutely no need for such quality (or even for the scene to happen at all, though it does show what a rush the military is in). In short, the film is a visual treat from start to finish. Also impressive are the little details that go into fleshing out the world or to giving you subtle visual cues about what characters are thinking. 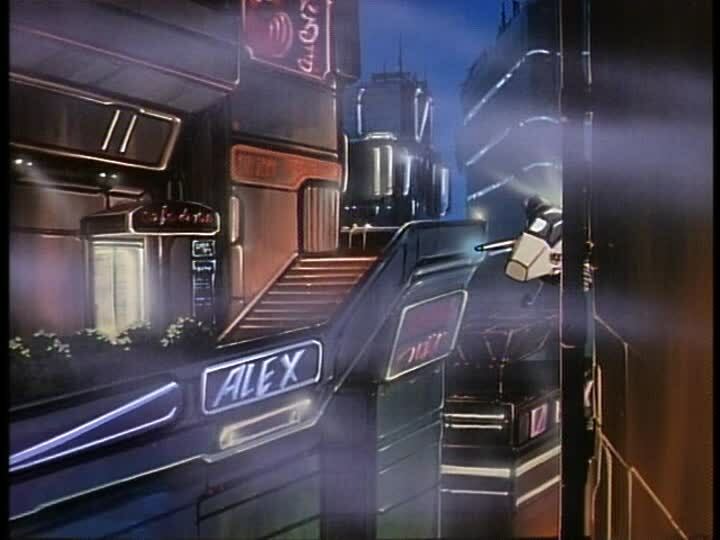 In a movie about the military fighting robots, they didn’t have to go about creating a detailed futuristic cityscape, but they did anyway. Neon signs, aircars, bystanders – the city has a lot of character to it. On the character end of things, there are numerous tiny details that bring them to life, but are never lingered on. Take Sybel, for example. This one shot of her establishes a TON of things about her character, without the need for the movie to talk about any of them. She’s a smoker, she probably knows how to ride a motorcycle, she can easily get wrapped up in her work, she almost certainly lives alone, the equipment cases and film reels point to her using a video camera in her work – all of this from one shot. 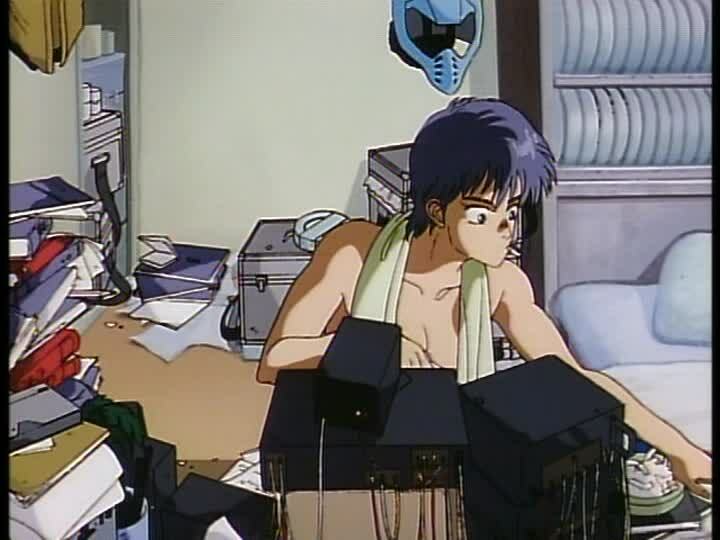 I should take a moment to mention that, yes, the movie does have some fanservice, as the above shot should make clear. It’s of the 1980s variety, however, which is to say that while it does happen, the movie doesn’t linger on it or go to extremes to get revealing camera angles, nor is time wasted that could be used on advancing the plot. This ends about as well as you’d expect it to against a conditioned soldier. What exactly are you going to do with that if it IS a killer robot? Even at the end of the movie, as the robot closes in, and Sybel has found a military rifle, she uses up all of its ammo firing wildly (which is exactly what you or I would do). Now cornered, she gets ready to use it as a club. 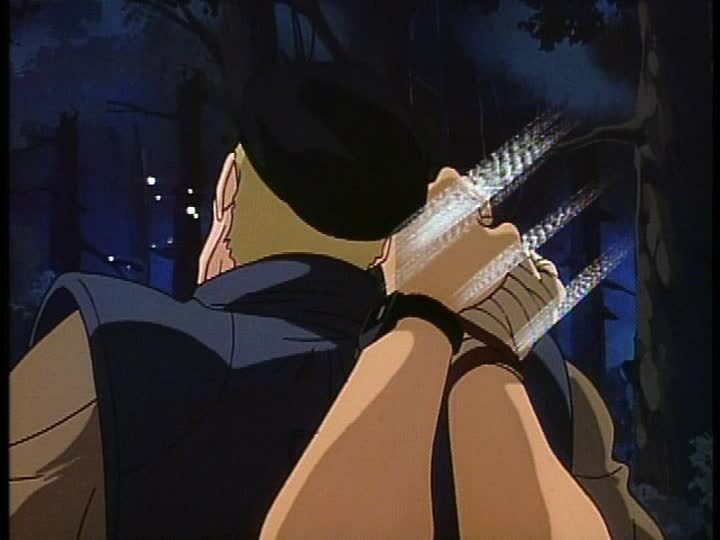 That shot is held for less than a second, but it says more about Sybel’s character than an entire episode’s worth of exposition. Perhaps the most interesting thing about the movie is that its tone and… “construction”, for lack of a better word, are completely at odds with the anime of today, and really, with a lot of anime as a whole. 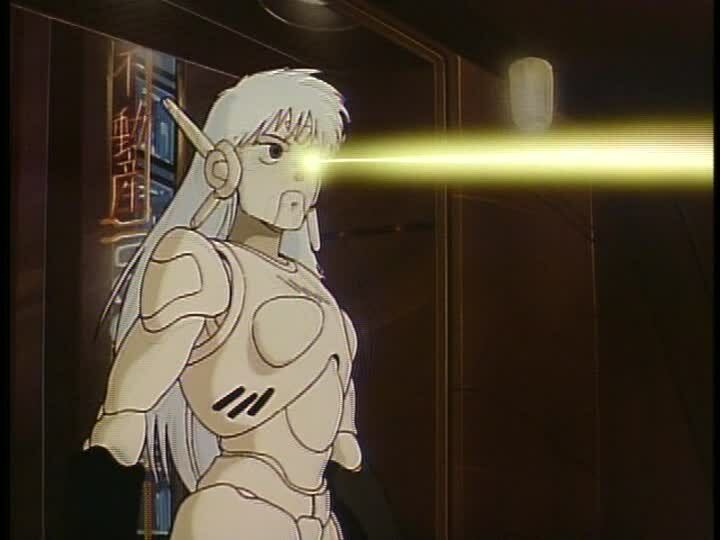 I’ve already covered that Sybel, ostensibly the main character, does not stand a chance in a fight against the robots – she has no special abilities, is not a martial artist, and cannot summon a wave of energy at the last second by shouting really loudly. It’s rather refreshing to have a character in anime by someone the audience can actually empathize with. Then there’s the military. From the beginning of the movie to the end, they are competent, intelligent when fighting, and professional. In another nod to the animation quality of the movie, every one of the soldiers looks different and has a face – no hiding their features under the shadow of their helmet here! They learn rapidly from their fights with the robots, and while they do take casualties, they are not wiped out to a man or ever in danger of being rendered ineffective. 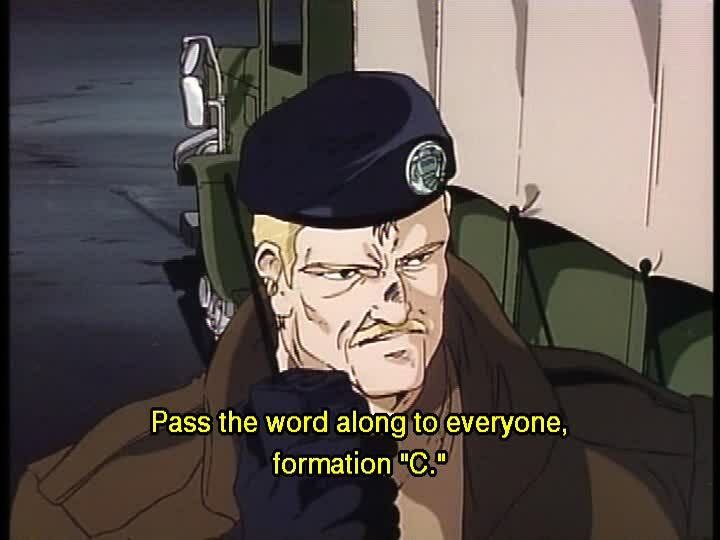 They are led by the Colonel, a man who is exactly what a military commander should be –a better strategist and tactician then he is a combatant, cold and calculating, but not unnecessarily cruel, and certainly not evil. He never fires a weapon at the robots over the course of the entire film, and carries only a personal sidearm – his radio is far more deadly, and it’s his quick thinking, excellent subordinates, and constant communication that gets the job done. The movie even takes the time to humanize him, as he agonizes over the losses his unit has incurred. 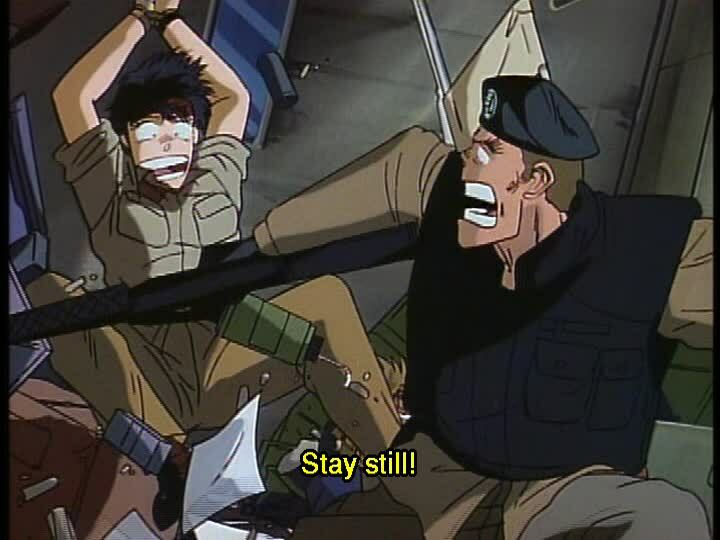 It’s such a break from the usual “faceless, ineffectual soldiers led by incompetent, evil commanders” I’m used to in anime that I would recommend seeing it just for that. Speaking of a break from the usual, there’s the robots themselves. Despite looking humanoid in body shape and having hair, these are not your standard anime robots. Those features are only to help them blend into a crowd long enough to get close to their target – once they have found that target, it’s a whole different story. For one, there is no reasoning with these robots – they don’t have personalities, never speak, and follow their programming to the letter. At one point, Ferris (who recognizes the robots from when her grandfather created them) calls out to one of them. There’s no hesitation in the robot, no moment of questioning its orders, no recognition that it knows Ferris or remembers her from when it was created – it immediately begins its programmed mission of murder. It actually behaves like a programmed machine instead of a human personality in a robot body, is what I’m saying here, in another break from anime tradition. 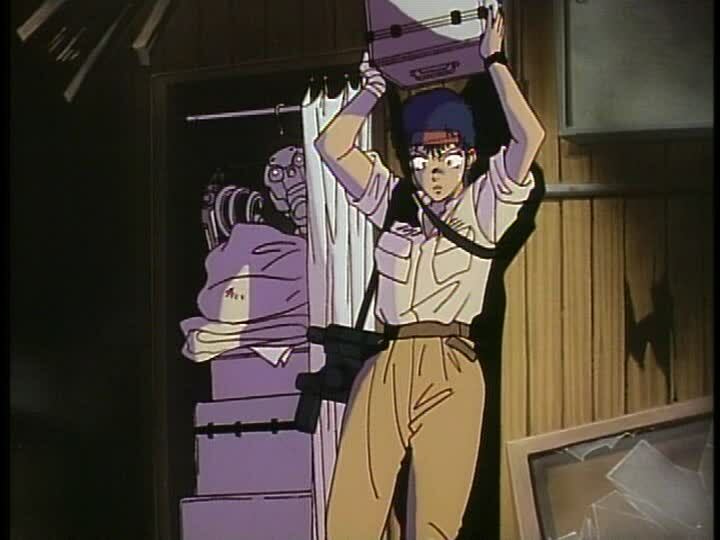 In short, everyone in the movie does their “job”, and does it professionally. At no point will you find yourself yelling at the screen that someone is an idiot for not doing the obvious thing. There is never tension that the military will fail to destroy the robots, only that the robots might accomplish their mission to kill Ferris before they are stopped. This, if anything, makes the drama on screen even more intense – it’s not a movie about the military versus killer robots, it’s about the robots versus two women trying to escape them, and this makes for a much more engaging story. To conclude, I would highly recommend this movie to anyone that wants to see excellent, high-quality (by 1980s standards) animation telling a focused, action-packed story with characters and situations that break free of the clichés we’re all used to.